This four-bedroom country house plan defines casual elegance with its front and back wrapping porches and triplet of dormers. An open, two-level foyer with palladian window leads to the expansive great room with cathedral ceiling. Windows all around and bays in the master suite and breakfast area of this house plan add space and light, while nine-foot ceilings create more volume. The chef-friendly kitchen includes a large center island that doubles as a serving bar, and the study/bedroom with large walk-in closet is ideal for overnight guests. Secondary bedrooms upstairs each feature their own bath and walk-in closet. 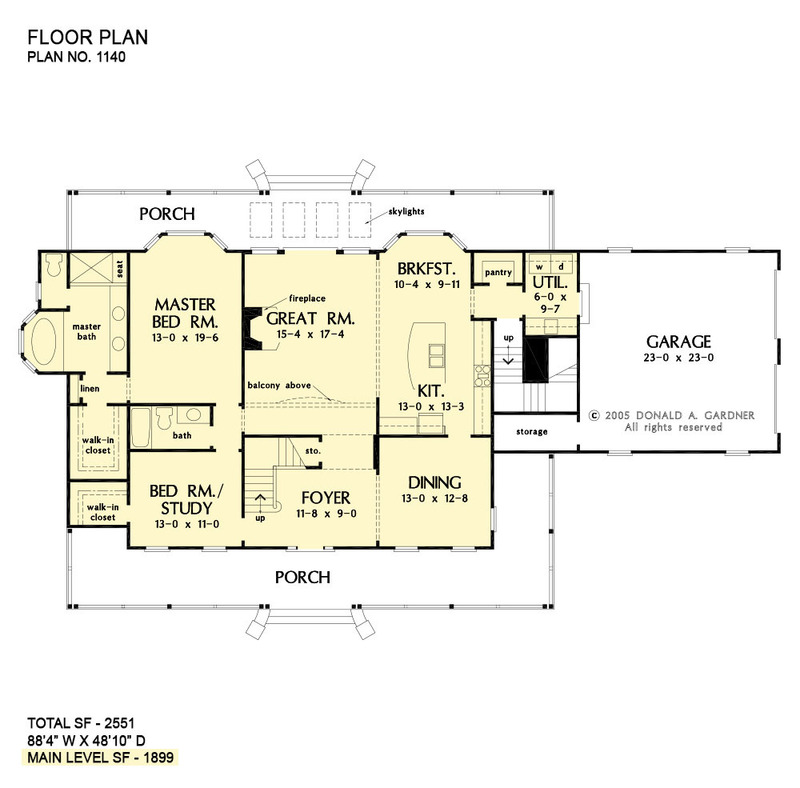 Note the ample closet space, garage storage area and generous bonus room! 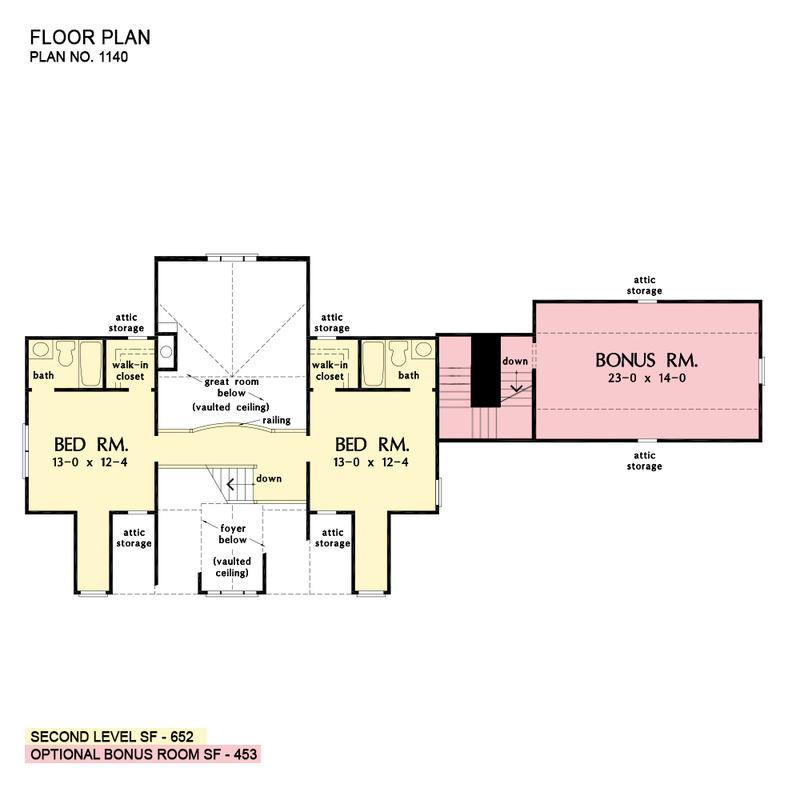 Bonus Room: 453 Sq. Ft.
House Dimensions: 88' 4" x 48' 10"
Master Bedroom: 13' 0" x 19' 6"
Bedroom #4 : 13' 0" x 12' 4" x 8' 0"
Bonus Room : 23' 0" x 14' 0" x 8' 0"
Breakfast Room : 10' 8" x 9' 11" x 9' 0"
Foyer (Vaulted): 11' 8" x 9' 0" x 20' 2"
Garage Storage : 9' 8" x 4' 2" x 0' 0"
Great Room (Vaulted): 15' 4" x 17' 4" x 21' 9"
Kitchen : 13' 0" x 13' 3" x 9' 0"
Master Bedroom : 13' 0" x 19' 6" x 9' 0"
Porch - Right : 7' 0" x 11' 2" x 9' 0"
Utility Room : 6' 0" x 9' 7" x 9' 0"